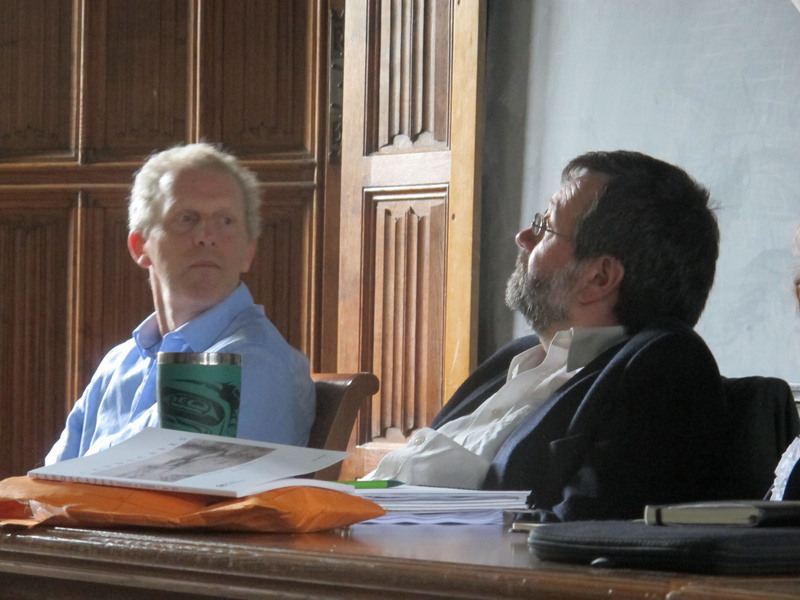 At the beginning of July we had our second annual academic advisory board meeting at Magdalen College, Oxford. We were very pleased to welcome Barry Cunliffe, Richard Bradley, Helena Hamerow and Roger Thomas for the afternoon to provide us with vital feedback on the project’s work to date. The first part of the meeting was devoted to issues surrounding metadata, our data cleaning strategies and, in particular, Chris Green’s innovative approaches to handling these large and disparate datasets, much of which can be read in earlier blog posts here. This raised a lot of discussion concerning the legacy of the project, in which it was felt that a new understanding of the datasets would be key. 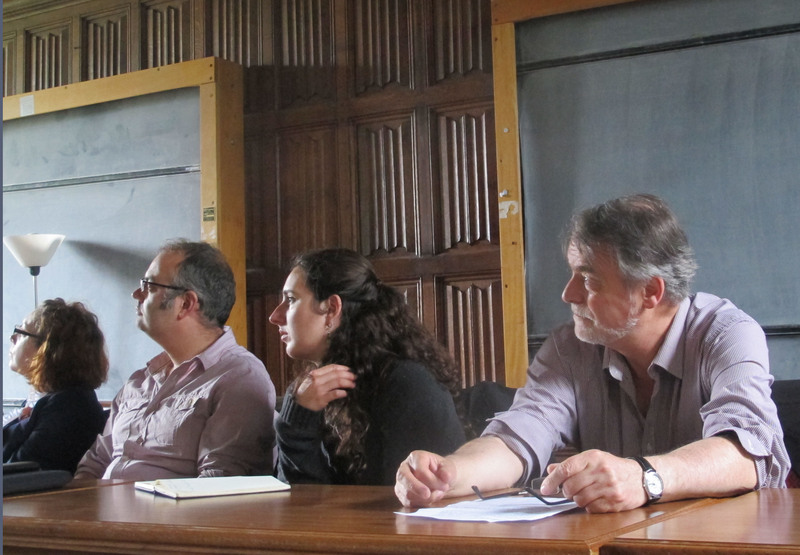 (l. to r.) Letty, Barry Cunliffe, Anwen and Chris Gr discussing hillforts. 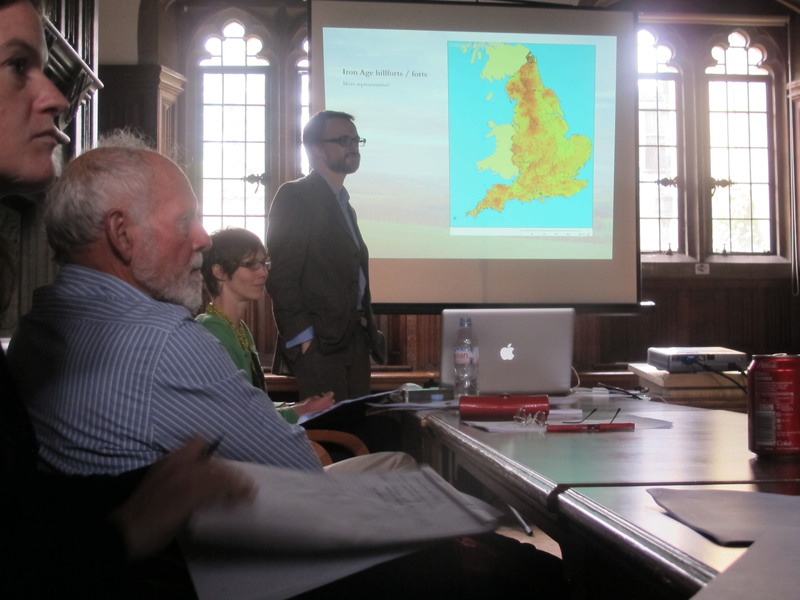 In the afternoon, the focus shifted to our work so far on the case studies in Somerset and Northumbria. One of the main issues here was the extent to which we should always rely on ‘flagship’ sites in our syntheses. We feel that the case studies present an excellent opportunity to explore how our narratives might change when these ‘flagship’ sites are taken out of the picture. New ways of thinking and looking at archaeology was also a theme in Miranda’s presentation on the art and public engagement activities of the project, which have been numerous, multifaceted and more far-reaching than any of us could have hoped (for more information, please take a look at Miranda’s Visual blog). (l. to r.) Zena, Dan, Sarah and Richard Bradley listening to one of the project presentations. Overall, we felt this was an extremely useful afternoon, which provided us with an excellent opportunity to take stock and reflect on our work so far. Discussing our major findings and methods with a wider group of experts was very productive and has given us much to think about as we move in to year 3 of the project. The only downside was that we all wished we had even more time for discussion – next year’s meeting might have to be a day, rather than just an afternoon! (l. to r.) Chris and Roger Thomas in discussion.